Fox News anchor Harris Faulkner sued toymaker Hasbro Monday, Aug. 31, 2015, in federal court in New Jersey for more than $5 million over a toy that shares her name. Harris' suit claims Hasbro wrongfully appropriated her name and persona with its plastic "Harris Faulkner" hamster. An anchor for Fox News is suing Hasbro for more than $5 million over a toy hamster that shares her name - and possibly even her resemblance. 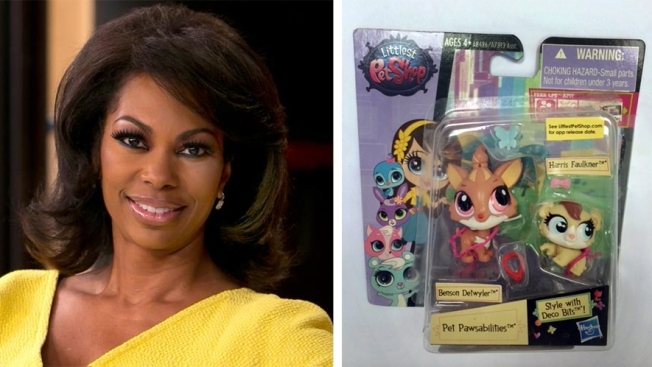 Harris Faulkner sued Hasbro this week over its plastic Harris Faulkner hamster, sold as part of the Pawtucket, Rhode Island-based company's popular Littlest Pet Shop line. She says the toy wrongfully appropriates her name and persona, harms her professional credibility as a journalist and is an insult. Her lawsuit says that in addition to sharing her name, the toy bears a physical resemblance to Faulkner's traditional professional appearance, including its complexion, eye shape and eye makeup design. The lawsuit says Faulkner never gave permission for Hasbro to use her name or likeness and that she even demanded in January that Hasbro stop using it. More than three weeks later, it was still for sale on Hasbro's website, the lawsuit contends. It says that as of July, Faulkner's name was still being used on a Hasbro website to sell Littlest Pet Shop products, and the plastic hamster that bears her name can still be bought at other online retail stores. "The Littlest Pet Shop product identified, and all products in the Littlest Pet Shop line, meet and exceed all safety standards," Duffy said.